Why do you turkey hunt in the rain? I've had many people question my sanity when I insist on hunting even when the rain is falling. The truth of the matter is, as a turkey hunter, you only have a limited amount of hunting time available to you each spring. If you only hunted during perfect weather days, you would be severely limiting your time afield. That's especially true during a hunting trip out-of-state where you may be limited to just a few days of hunting anyway. If you are like me, you are going to spend every minute of that out hunting. Rainy days do put a damper on a hunter's spirit but the birds are still out there just being turkeys. They are just a little harder to find and call in. Now, if it comes a hard downpour with wind and it sticks around all day, even I do not like to be out hunting. But the spring is full of those days where there is intermittent rain or times where there is a light drizzle all day. It's those type of days I actually look forward to. One of the biggest advantages of hunting in the rain is simply your ability to see turkeys. Nothing will make a turkey more visible than rain since they like to get out of the woods and go out in the fields and short pastures where you can spot them. Turkeys cannot hear very well during a rain storm so they will move out in the open where they can depend on their eyesight more for protection. Almost any experienced turkey hunter will tell you to head to the fields when the rain is coming down. 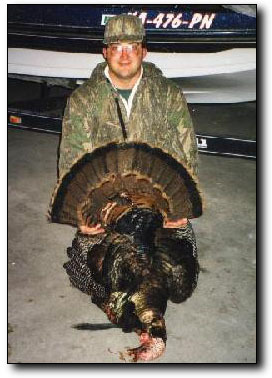 I used this to my advantage one year when I took the old gobbler shown here. I knew of a particular little field that was just a magnet for turkeys when it rained. During one especially rainy day one spring, I made a decision to go turkey hunting a little after noon and try to be there later that afternoon or evening when the birds hit the field. This field was really out in the open so my best chance would be to set up along the turkeys path coming into the field. I did just this setting up along a fenceline of a pasture that led down to the open field. After, I got setup I did some calling on a glass friction call and almost immediately got a gobble response. I called once more and he gobbled right back. I then shut up and waited for awhile since the bird sounded like he was about 300 yards away up in the pasture. After about 15 minutes I called again with no response this time. I was disappointed but not really worried since I was in the perfect spot between him and the field which now had a small bunch of hens feeding in it. I waited a little longer and sent out a soft series of yelps. I heard a very distinctive gobbler cluck off to my right. I still could not see the bird but I knew he was probably within 50 yards or so behind a small bunch of cedars. I then let loose a couple of cluck and purrs and laid my call down. About a minute later a very wet and bedraggled old gobbler came wandering around the cedar. He was not strutting and if I had to describe his walk, I would say he was skulking; like a rooster pheasant does when he is running through cover trying to stay hidden. He was a pretty sorry looking bird but there was nothing sorry about the beard hanging down from his chest. I shifted the aim on my gun and pulled the trigger. This was not one of those classic video hunts where the bird comes in gobbling and strutting all of the way. This was a 2 gobble and one cluck hunt from an old and wise bird who as far as I know never strutted once on the way in.. He looked like a half-drowned turkey vulture when he came around that cedar but he was responding to calls in a fairly steady rain. This hunt proved to me that even when they are soaked, gobblers still are thinking about hens. Hunt the fields , open pastures and old roadbeds. Turkeys like to get out in the open when it rains. Switch to friction calls rather than use mouth calls. You can hear a friction call at a much greater distance, especially in the rain. Carbon and acrylic strikers for your friction calls can help when it's raining. Use a plastic bread bag or something similar to cover your box call or friction call. You can effectively run a box call in the rain as long as it stays dry inside a plastic bag. Be prepared for silence. Rainy days are not comfortable days for turkeys either and they will mostly be quiet. Think about what mood you would be in if you were wet and cold. The turkeys, like most everything else, are not in a good mood and will not be gobbling near as much.. They're cold and hungry and will be found near a food source or out in the open. Carry and use a good pair of binoculars. You will have to depend more on your sight than your hearing to find gobblers. The turkeys will be more visible during the rain since they cannot hear as well so they like to get out in the open in fields and pastures or roads so they can use their eyesight to spot approaching danger. Cover the hunting ground slowly and methodically. Turkeys will most likely be out in the open so you'll have to patiently look for your turkeys where you think they may be visible. You probably won't be able to call to find them because the birds won't gobble back as much in the rain. Stay comfortable by dressing for the weather. If it's raining, wear rain gear so you can stay out in the woods. If it's cold, make sure you've got proper gear to stay out and keep warm. You can't expect a turkey to show up right away. You've got to be patient and weather the storm. To do that, you've got to have the right clothes. For me, the vinyl style ponchos work great in the rain. I know there is a lot of high-tech clothing available now but none of them seem to work as well as the old fashioned vinyl or rubber ponchos or rain suits. Use the rain to your advantage. You can move in closer to turkeys when rain is falling because they can't see or hear you as well as they can on a sunny day. Go scouting. Rainy days are also good days to scout prior to the turkey hunt. If you learn where the turkeys are in the rain, you can use that knowledge to your advantage later. Turkey & Turkey Hunting Magazine focuses on turkey hunting techniques, turkey behavior and biology, the latest wild turkey research for hunters, equipment, destinations, and hunting ethics.